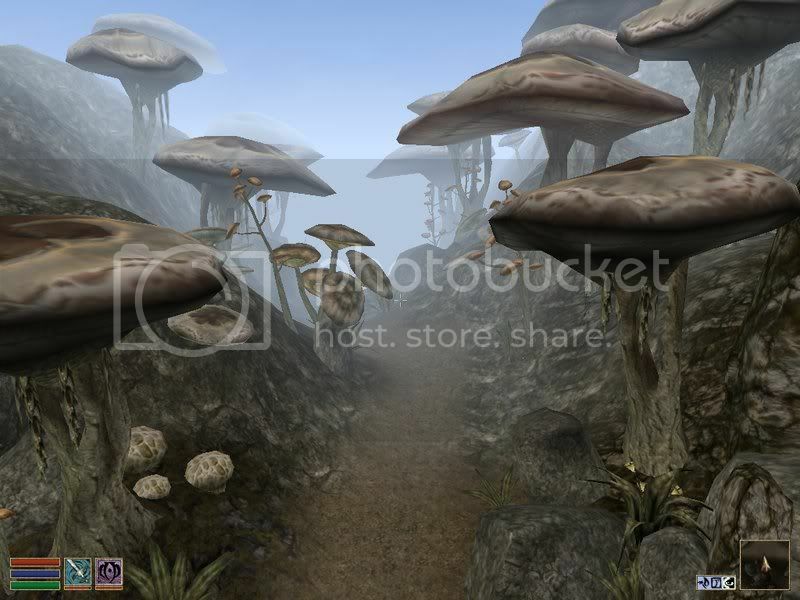 My favorite immersive world: Morrowind. Bethseda’s 2001 entry to The Elder Scrolls series is till this day one of my favorite video games, as well as immersive experiences. There are so many things in this game that make it more immersive for me than either Oblivion or Skyrim. Of course, it is harder and not as user-friendly as the newer games, but once you’ve gotten into it, you realize that is so much deeper than its newer follow-ups. 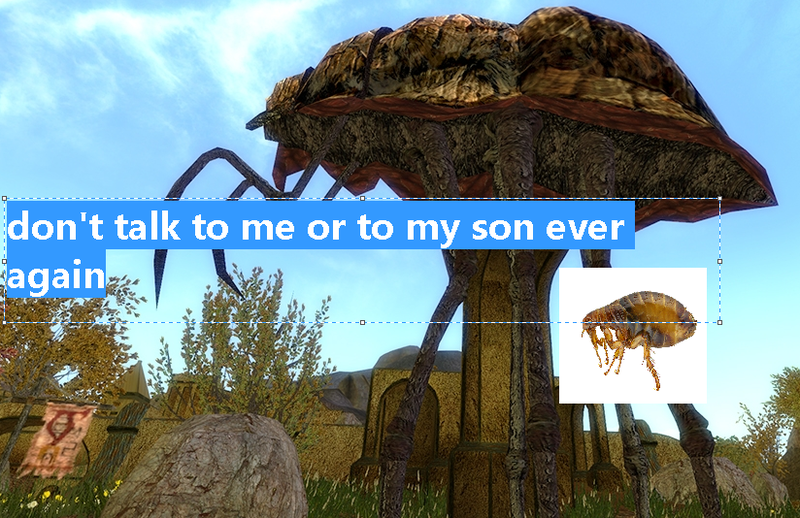 The world of Morrowind is more unique and original than the worlds of the new Elder Scrolls games. Oblivion and Skyrim add fantasy elements to worlds that resemble a lot to medieval empires, the world of Morrowind goes for a weirder, more unearthly setting, complete with gigantic mushrooms, gigantic flea-like thingies as a transportation method (more about that later), and has an overall feeling to it that might scares away most of today’s mainstream gamers, but is of state of art design by itself and after the gamer has gotten used to it, is arguably more immersive than the new games’ more realistic sets. Is that a tree? Is that mushroom? Where the heck I am? Do any of these things matter? Besides the main storyline that is challenging, but epic and rewarding, the side missions contribute a lot to the immersiveness. The guild missions provide a sense of belonging to an organization, complete with a sense of progress through different in-game organizations. A lot of side quests are not even marked and the gamer needs pure luck to stumble upon some of them on the map. 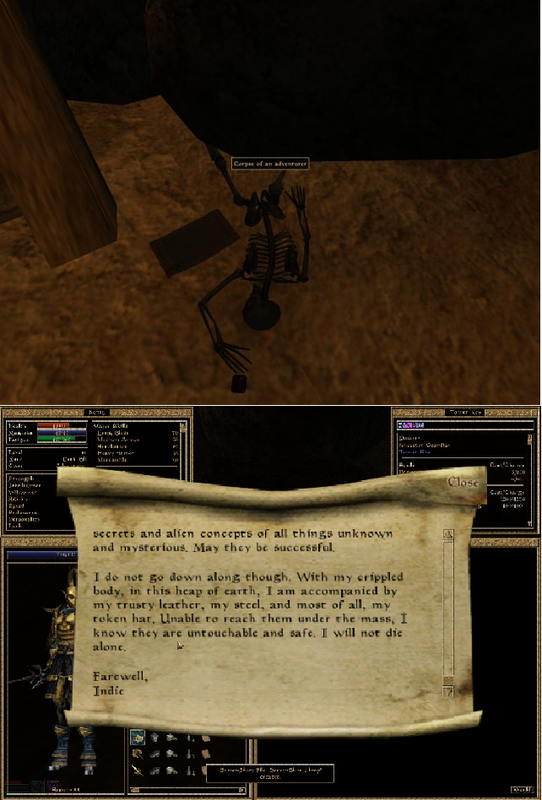 Generally, stumbling upon stuff is a huge part of Morrowind’s gameplay and is the most important drive for the gamers’ explorations. The game never fails to offer hidden missions, treasures, easter eggs at the most unexpected places (I once found a full armor at the bottom of a lake inside of a cave where I had really nothing to do). The sense of exploration is more real than in the TES games that came after because of the different fast travel system: while in Oblivion and Skyrim you can basically effortlessly teleport between places you have visited, in Morrowind there are certain stations where you can use fast travel which is riding a gigantic, ungodly flea-monster and only stops in a handful of cities. This way of course you need to walk a lot, but those walks are never boring. The engine also allows the gamer to combinate, craft and enance items and weapons in a way that wasn’t possible in the later games. The whole Elder Scroll series enables gamers to play according to their own style and focus on abilities and skills that they prefer, but this eleveated sense of crafting is what makes the picture whole in Morrowind. These senses of hidden possibilites, mysteries that won’t solve themselves (as opposite to straightforward, simple gaming experiences offered a lot nowadays), and a process af exploration that feels genuine and real are what make Morrowind one of the most immersive games ever.